Oesophagogastric cancers have a low incidence and poor prognosis, with five-year survival rates ranging from 20 to 30%. Further details are available in the fact sheet linked to below. There is an important role for GPs in delivering preventative health messages on smoking cessation and moderation of alcohol intake; awareness of risk factors and symptoms for earlier diagnosis; correct referral to appropriate specialists; and monitoring and supporting patients through treatment, which is usually palliative rather than curative in intent. In Victoria, all six PHNs are working together to promote the adoption of the OG Optimal Care Pathway into primary health in 2018. This project is supported by the Victorian Government. 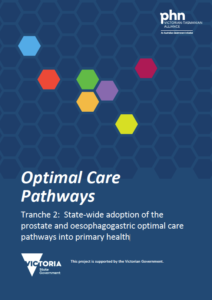 Following the Optimal Care Pathway has the potential to significantly improve the experience for patients by building general practice’s awareness of symptoms, referral pathways, management options and supportive care needs.